If you want to travel through Costa Rica it is important to remain aware of traffic tickets and the most common mistakes of the drivers. Better to measure twice and cut once. 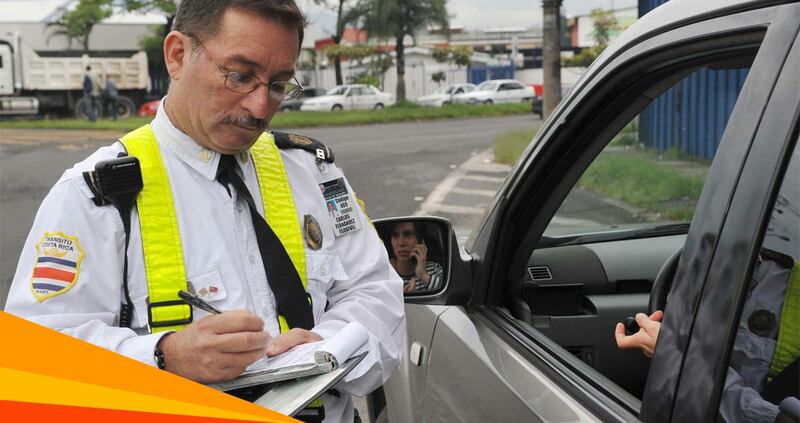 In the province of SanJosé, exists the vehicle restriction. This means you can not enter the city center depending on the day and last plate number of your car. That’s why it is important to remember that from 6 am to 7 pm you cannot enter the capital, otherwise, you could be stopped by a traffic police that will impose a fine of COL.¢21,000 (US$39 approx.). Keep in mind that if your car has finished in plates 1 and 2, can not pass through San Jose on Mondays. Tuesday is the day for the restrictive plates ending in 3 and 4, while Wednesdays will not travel the cars with plate endings 5 and 6; Thursday restriction applies for number plates 7 and 8, finally Friday will be restricted to those ending in 9 and 0.
Who stops on horizontal signaling, except stop sign. Who drive slowly within 50 feet of another slowly car. If you breach the circulation of roundabouts, priority crossing, disrespects traffic signals or have a device to override or hoax monitoring devices of the Transit Police; you would be sanctioned with COL ¢49,000 (US$90 approx.). Whoever driving without a seatbelt or allow companion do not use the seat belt. Violating the rules of conduct regarding the use of mobile phone as well as any other means or system of communication while driving, except handsfree. The driver who pass another vehicle that has stopped in front of crosswalk area. Who drives without lights from 6 pm to 6 am, or at times when visibility is difficult. A person driving heavy load vehicles in urban, suburban, areas not authorized by the MOPT. Drivers traveling on sidewalks with motor vehicles. When you are driving be careful to disrespect the stop sign at an intersection or to take children or less than 1.45 meters tall without safety seat or booster, and if you drive a motorcycle or moped you can not drive with a lower 5 year old child. Any of the above actions could sanction an amount of ¢ 198,000 COL (US$363 approx.). Violating the ban U-turn or left turn in places where there are vertical and horizontal signaling. Invading the opposite lane and it’s separated by a barrier continuous line. Who drives with a suspended license or more than 120 kilometers per hour speed. Anyone who drives under the influence of alcohol. Such amounts are defined based on the price index year (CPI, for its acronym in Spanish). The Costa Rica’s regulatory authorityf for vehicular traffic is the Road Safety Council (COSEVI, for its acronym in Spanish) with dependece of the Ministry of Public Works and Transportation (MOPT, for its acronym in Spanish), but with complete independence in their administrative operation.